8/2 Cup of Coffee: Rain was a dominant theme on the night as two contests were shortened by rain, while Portland saw its game canceled and Pawtucket's was delayed 37 minutes. Greenville also played a doubleheader thanks to a suspended game on Tuesday, meaning Lowell was the only stateside affiliate unaffected by the weather. Bobby Dalbec had half of Salem's four hits, drilling a home run to go along with a triple and Chandler Shepherd pitched 6 1/3 sparkling innings for Pawtucket, and Jhonathan Diaz did his best to overshadow him, with seven one-run frames. In a contest lengthened by a rain delay, Pawtucket added five runs in the eighth to pull away. Chandler Shepherd turned in a strong 6 1/3 innings, allowing one run on five hits. He did not issue a walk but struck out three. Each of the nine PawSox contributed with a hit and Tzu-Wei Lin, Tony Renda and Sam Travis each had two knocks. Lin added two RBI, while Anuery Tavarez hit a home run. The weather in Pennsylvania washed out Wednesday's contest. It will be made up as part of a doubleheader beginning at 12 p.m. on Thursday. The Hillcats scored a pair of runs in the bottom half of the sixth and soon after, the rain pushed the game into a delay it would not come out of. 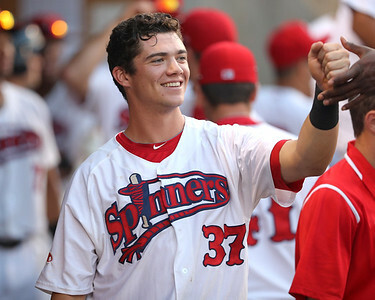 SoxProspects.com's player of the month Bobby Dalbec was 2 for 2 with a triple and a home run, adding a walk as well. Jake Thompson's start was short, allowing two runs on two hits. He walked three, contributing to his early exit. Algenis Martinez performed admirably in long relief, delivering 4 1/3 shutout innings on two hits. He struck out five and walked one. The Drive scored the only run after the resumption of the suspended game but still fell in the first half of a doubleheader. Zach Sterry had two hits including a solo home run. Marcos Lantigua delivered 3 2/3 shutout innings, while all four runs were charged to Angel Padron's tab, who surrendered them in a 2 1/3-inning start. It took until the final inning, but the lone run scored was enough to hand Greenville a doubleheader sweep. Everlouis Lozada had two of Greenville's five hits, and Jhonathan Diaz pitched a complete game, allowing just the one run on four hits. He walked one and struck out nine. Lowell's four-run fifth was the difference, increasing the Spinners' lead to 7-2 at the time as they broke out for 13 hits. Korby Batesole had three hits to go along with a pair of RBI. Not to be outdone, Xavier LeGrant was 3 for 4 with two doubles. Despite four walks, Tanner Raiburn turned in two no-hit innings, and Chris Machamer allowed both runs on five hits in three innings. The Red Sox only grabbed five hits, including a Chad Hardy two-RBI triple in the sixth, but took advantage of two errors and a wild pitch in the first inning to score three runs after a pair of singles to lead off the weather-shortened contest. Starter Jose Gonzalez allowed the only run, and it came unearned in the third. He pitched four frames, allowing four hits against a walk and two strikeouts. Juan Morillo pitched a perfect fifth in relief. The Red Sox cranked out 10 hits but were held to only one run by a duo of Astros pitchers. Fabian Andrade, Erick Flores, and Ruben Hernandez each had two hits, but it was not enough. Miguel Suero scattered four hits across six innings, allowing only an unearned run to cross the plate, while Luis Colmenares gave up the game-winning run in the ninth on a wild pitch after a lead-off triple. He allowed just two hits to go along with two strikeouts. The Red Sox only notched six hits, but they were enough thanks to four Rays errors in a low-scoring affair. Two of them came from Angel Maita, who also added a triple. Robinson Parra completed the game with his first save, throwing four shutout innings. He did not strike out a batter and walked two, but was nonetheless effective, surrendering just two hits. Irvin Villaroel performed almost as well in the starting role, putting five one-run frames on the ledger. He struck out four against zero walks, giving up five hits. Player of the Night: There were two strong choices on the mound, but Bobby Dalbec's 2-for-2 evening with a triple and a solo home run is the winner. He hit his 26th home run of the year and now owns two triples. He capped off an already strong night with a walk in his third at-bat and scored two runs. Dablec was named SoxProspects.com's July player of the month and did about as well as he could have to begin August.